I was back in my favourite Australian city, Melbourne, this week for a combined work and catch up with friends trip. A friend lives close by St Kilda and she decided that we would go to Miss Jackson’s as she had been there before and really liked. She described the menu before we went and I was curious! On arrival, we had the option to sit outside or inside. We decided on the long bench at the top of the steps and grabbed the menu to look at. 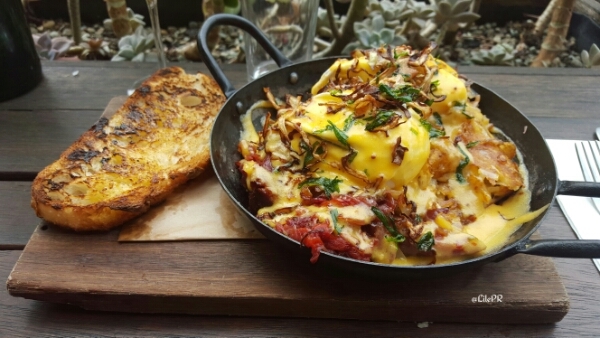 I was torn between the Smoked Ham Hock Hash ($18) and the Baked Eggs ($16.50). The smoked ham hock won the decision for me. After a long day at the Melbourne Cup, it wasn’t a coffee I was interested in, I ordered a Mimosa! 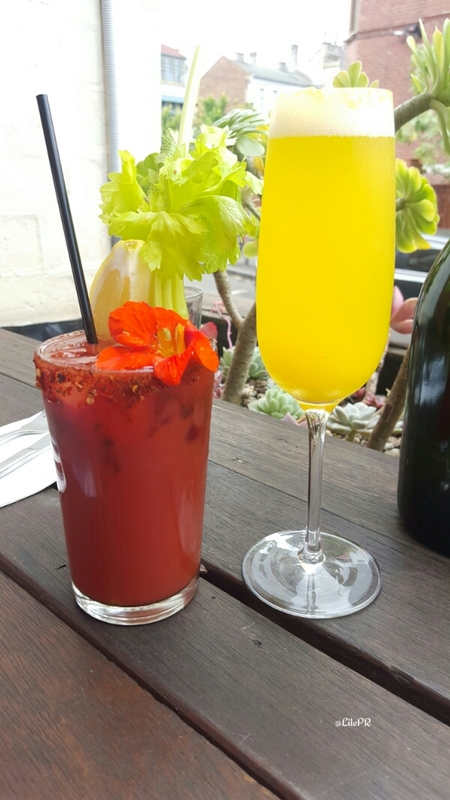 As mentioned, Ms. dG craved the Sweet Corn & Zucchini Fritters $16.50 and a Bloddy Mary (non virgin). Our drinks arrived shortly after ordering…how pretty are they! My dish arrived first and it looks absolutely fantastic! I’m making a bold statement by saying that this is definitely my favourite breakfast dish to date. I couldn’t believe the size of it and the beautiful colours that filled the cast iron dish. I’ll start at the top of the dish, as you can see there are 2 poached eggs perched on top of a huge potato hash and underneath this there was a scrumptious portion of smoked ham hock. The poached eggs were perfectly cooked and were coated in a mouthwatering hollandaise sauce. The potato hash was absolutely delicious, it was flavoursome without overpowering the potato taste. The red you see on the dish was a portion of red cabbage with a slightly caramelised taste. Under this were chunks of melt in your mouth smoked ham hock, I don’t know if I can do this full justice. Even the toast was great, what a dish! Ms. dG then received a dish but it didn’t look like fritters and the waitress quickly realised she had made a mistake and took the dish back. While waiting for Ms. dG’s fritters, this arrived as a form of apology. If only that were the case in every establishment that made a mistake taking an order. 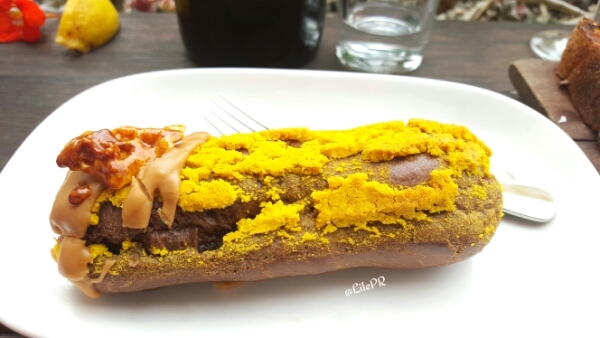 This is the Banana & Salted Caramel Eclair. Much to my own annoyance, I was turned off bananas when I was younger so I tasted the eclair’s underside and the white filling, well it was simply divine! It’s safe to say that Ms. dG wasn’t overly sad that she didn’t have to share it! Anywho, Ms. dG ate breakfast first and knew that she would enjoy the dish before her first mouthful. 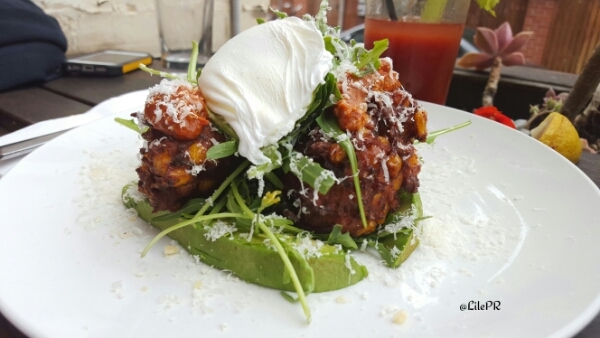 I had the second mouthful which was a combined fork of fritter (minus the corn) and capsicum jam. What an explosive flavour combination! The poached eggs were cooked to perfection also. The presentation of this dish was nicely done! So how do I rate it? It’s not very often I have commented that our breakfast is the best that I have ever had so I think there is only one rating for this cafe. Even though there was a mix up with the order the food was worth the extra few minutes wait and it was sweetened with a free dessert which is always going to work out well! I cannot fault a single thing, when food is good, it’s good!